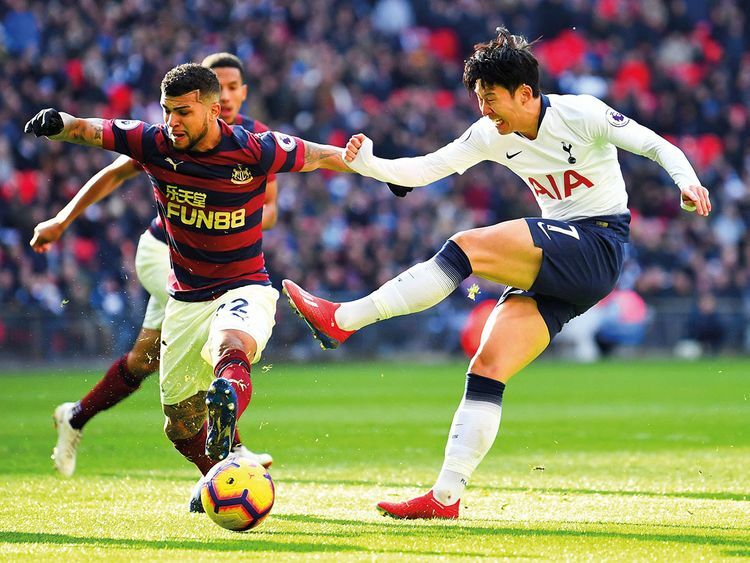 London: Tottenham left it late again, but Son Heung-min’s strike seven minutes from time earned a hard-fought 1-0 win over Newcastle on Saturday to leapfrog Manchester City into second place in the Premier League. Mauricio Pochettino’s men close to within four points of leaders Liverpool, who are in action at West Ham on Monday, but just as significantly open up a 10-point lead on Arsenal and Chelsea in the race for a top-four finish and Champions League football next season. Club record 20 million pounds signing Miguel Almiron did not have international clearance to make his debut so Rafael Benitez named the same side that started against City with the same game plan to defend deep and frustrate their opponents. Fernando Llorente was left on the bench after the 33-year-old played the full 90 minutes in Spurs’ previous three games leaving Lucas Moura to lead the line. The Brazilian had Spurs’ best chance of the first 45 minutes when he headed wide with the goal gaping from point-blank range. A similar pattern followed in the second-half, but Newcastle nearly caught Spurs cold with a flowing counter-attack when Salomon Rondon’s powerful header from DeAndre Yedlin’s cross came back off the post with Hugo Lloris stranded. Lloris also had to make a flying save to turn a curling effort from Perez behind. But the vast majority of the play was up the other end as Spurs laid siege to Newcastle’s wall of 10 men behind the ball. Instead it was Son who again stepped up to the mark, just as he did with an equaliser against Watford in midweek, to compensate for Kane’s absence with his 14th goal of the season. The South Korean had a helping hand from Dubravka, though, as the Newcastle keeper let Son’s powerful effort slip beneath his grasp to undo all his side’s good work in holding out for 83 minutes.